I've had this book for a while in my "to read" pile, but I was a little intimidated by it. But then I picked up a copy of Compleat Catalogue of Comedic Novelties by Lev Rubinstein and as I started to read Rubinstein's book of poems, I realized that he had been a friend Ilya Kabakov and an associate of Collective Action, two of the main subjects of The Experimental Group: Ilya Kabakov, Moscow Conceptualism, Soviet Avant-Gardes .I thought it would be useful to give Rubinstein some context if I knew more about the milieu he arose from. And I was right. Matthew Jackson combines vast art historical and theoretical erudition with a rare ability to understand specific social milieus and psychological motives that govern individual artistic strategies. His book offers a fascinating--and at the same time precise--description of the Moscow artistic scene during the times of the cold war. Here it's important to mention apartments. During Stalin's rule, people lived in collective apartments, forced to room with strangers. This was mainly due to a lack of housing but also served the state as a kind of panopticon--everyone kept an eye on everyone else. Under Khruschev, a massive building program of cheap apartments was begun. These apartments have come to be called Khrushchyovka. They were utter crap, but they made private lives possible. The double lives mentioned above were greatly facilitated by the Khrushchyovkas. (Good descriptions of Khrushchyovkas and their effect on society can be found in Svetlana Alexievich's powerful oral history of the end of the Soviet Union, Secondhand Time: The Last of the Soviets .) For unofficial artists, who had almost no public space for exhibiting art, apartments were of supreme importance. They provided a place for artists to meet, to look at each other's work, and develop ideas. Kabakov's apartment was an important meeting place for all of the unofficial artists of the 1970s. Jackson quotes Groys, "There was no art market, no spectators from outside. This means that these artists made their works for their colleagues--other artists, writers, or intellectuals involved in the unofficial art scene." And Lev Rubinstein remarked, "I am from the underground, and for me the public is a certain aggregate of my friends and acquaintances that serve as a reference group that forms my aesthetic values." The thing was, the artists were never sure how tolerant the state was going to be at any given time. For example, Kabakov didn't participate in the bulldozer show, even though he was invited to do so. He knew it was a provocation and he had a lot to lose. Kabakov was an official artist in his day job--a member in good standing of the artists' union, working as an illustrator of children's books. We like to think of unofficial artists in the USSR as heroic dissidents, like Joseph Brodsky or Aleksandr Solzhenitsyn. I think we in the West valorize those dissident artists because we imagine that we would act in a similarly heroic way in the same situation. But I think we would act more like Kabakov and Monastyrsky and Rubenstein--work quietly, leading double lives, constantly negotiating within our hearts what the state will let us get away with. 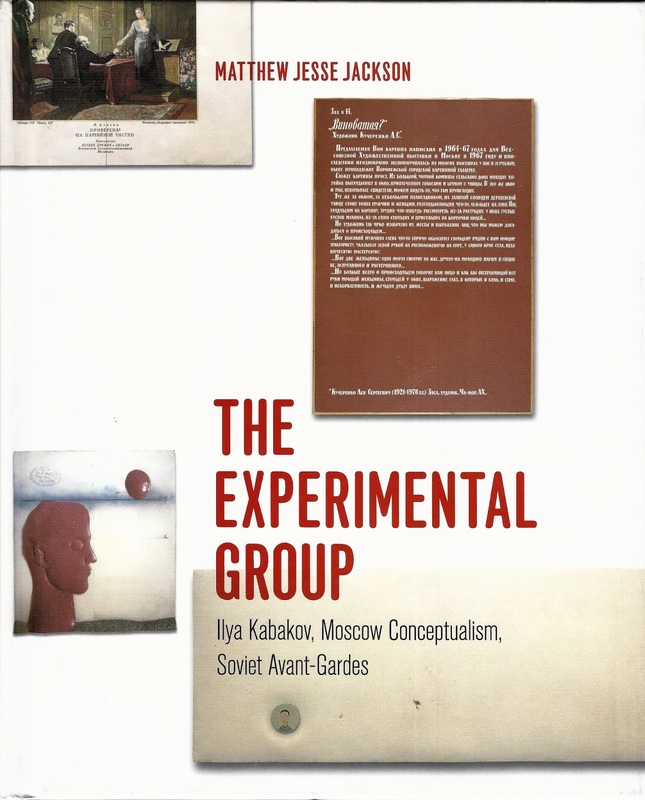 Collective Action was Andrei Monastyrsky's group that did what in the West we would call "performance art." But while "performance art" here is done for generally small audiences in public venues, Collective Action's performances were done for handpicked audiences of friends. The friends would often be participants in the actions, which often took place in open fields or forests on the edge of Moscow. 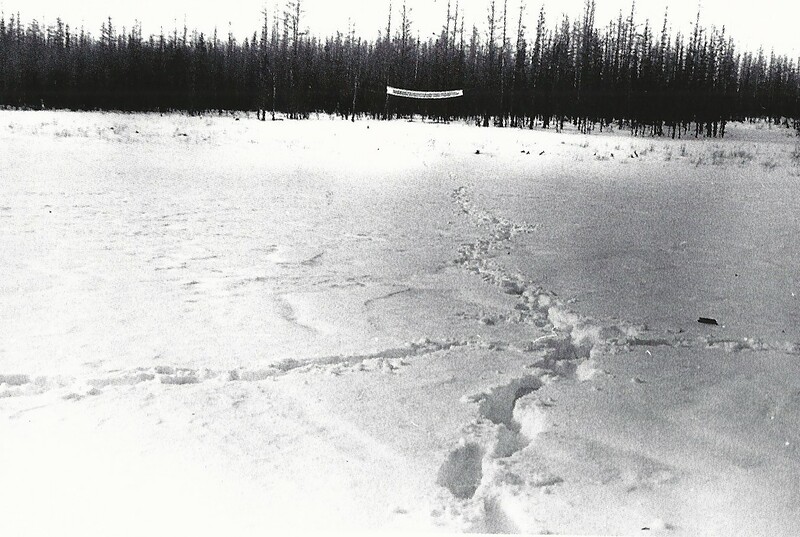 For Slogan--1977, the group went to a field on the edge of some woods, two members raised a banner between two trees (that read, "I am not complaining about anything and I like this, although I have never been here before and know nothing about this place"--similarly mysterious lines are found in Lev Rubinstein's poetry). 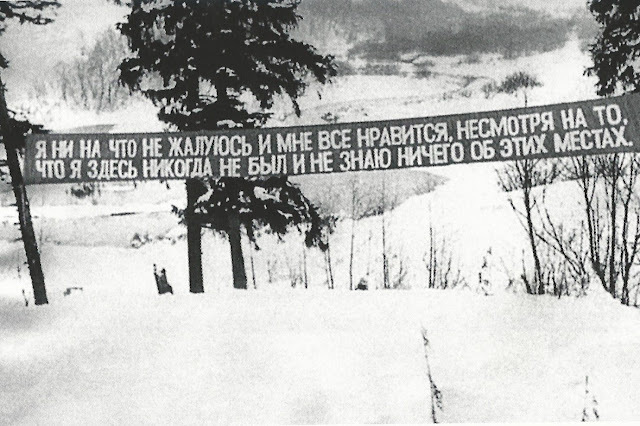 But an even more obscure performance involved Monastyrsky mailing a banner to Georgy Kizevalter with instructions. Kizevalter lived in Siberia and was instructed to raise the banner between two trees by himself, walk a certain number of paces away, and photograph it. It was a performance for one person, who was both the performer and the viewer! Jackson's criticism and interpretation is erudite but he sometimes outsmarts himself. Writing about Erik Bulgatov, he writes "His best paintings sidestepped irony, offering unremarkable landscapes interrupted by precise rows of red letters. 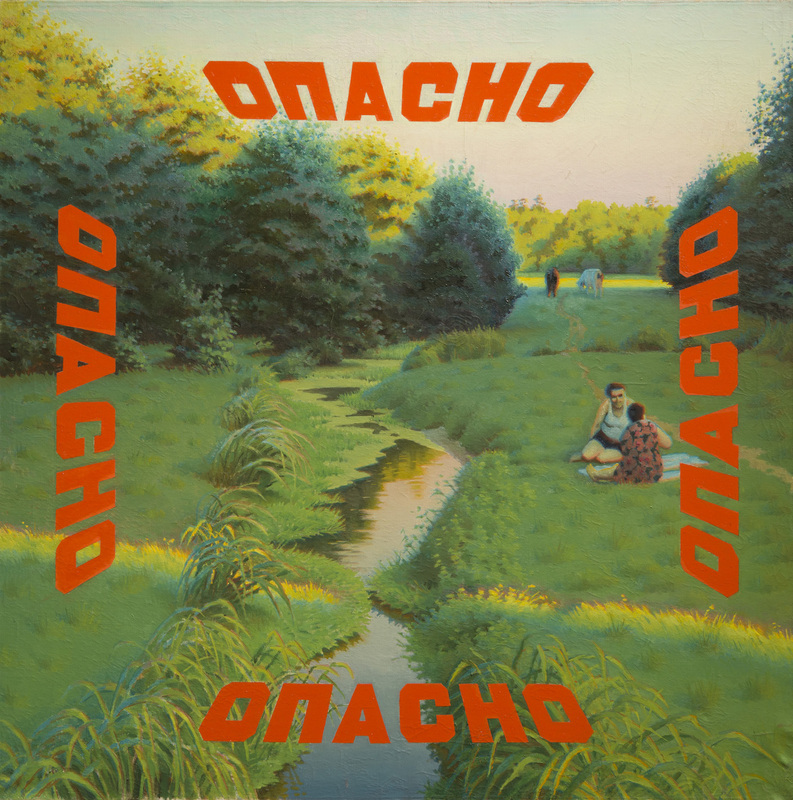 It is often said that such works "critiqued" Soviet reality, and no doubt they did, but the canvases amount to much more than postmodern political declarations." He then goes into a fascinating and detailed analysis of the painting Danger (1972-73) which is undoubtedly correct, but it seems unreasonable to deny the easy irony of the painting--a realistic scene of bucolic beauty superimposed with the word "Danger" four times. Irony is hardly "sidestepped" here--it is in fact shoved into the viewers face. Ilya Kabakov eventually started doing "albums", which were series of drawings and texts that he would perform for guests in his apartment. Here, Jackson writes, "[Kabakov] had grown interested in narrative, grids, serial images, and frames--devices that seem incompatible, given the grid's presumed hostility to narrative." Presumed by whom? Here Jackson's erudition fails him. 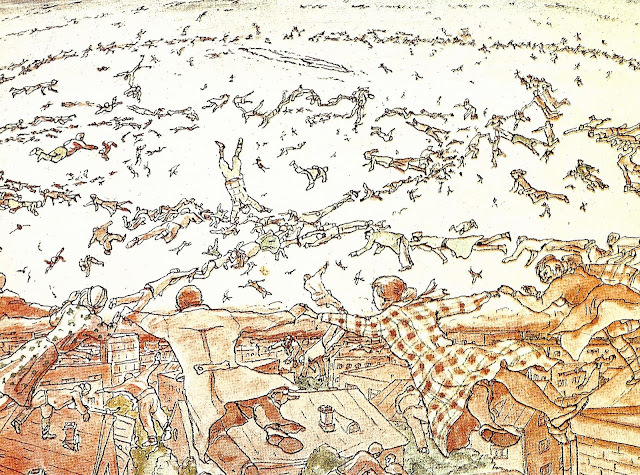 I've always thought that Kabakov's albums bore a resemblance to comics (which are, after all, narratives told in grids, with serial images in frames). I kind of dismissed this given the performance aspect of the works. But given the descriptions by Jackson, it seems reasonable to view albums like Ten Characters as a type of comics. And in the albums, we can see how his day job as a children's book illustrator affected his night job as a conceptual artist. His drawing style, combining linework and coloring, is like illustration and indeed very similar to much comics artwork. Indeed, this relationship between Soviet unofficial artists' day jobs and their art is underdeveloped in Jackson's book. (For example, Lev Rubinstein's poems were written with one line on a separate card, not unlike a card from a card catalog. His day job was as a librarian.) I have long wished that someone would publish Ten Characters as a book (dual language, of course), so we could read Kabakov's narratives. But these are minor complaints. The Experimental Group is an amazing work of art history and illuminates an almost entirely underground scene brilliantly.